Miss M: What are you going to put on your blog next? Miss M: MOM! we're not Hobby Lobby or Walmart! Miss M: You know! They always put their holiday stuff out waaay early, like in July. It's still August, DON'T be like them! Guess what? I didn't listen! I'm going to post a fall themed project anyway. After all, September is just 5 days away AND these are last years projects anyway so I will save the new stuff for September 1st, that's fair right? Would you have guessed it was made with a roll of toilet paper? Nope! Me neither. So, all you do is get a square of orange fabric and place the TP on top of the fabric, in the center, then wrap the fabric up and tuck the ends into the center of the roll. Then to finish the look, add a stem and a leaf and you're done. 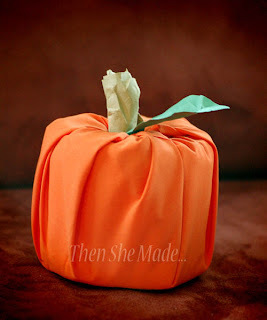 This is so easy for little crafters to do and it's fun because it's an I.G. project (Instant gratification) with very little mess or tweaking needing. However, if you want to step up the level of difficulty just one notch you can make the same thing but out of paper instead. I like it both ways but I lean towards liking the decorative paper options slightly better just because you can mix pattern papers and add texture. 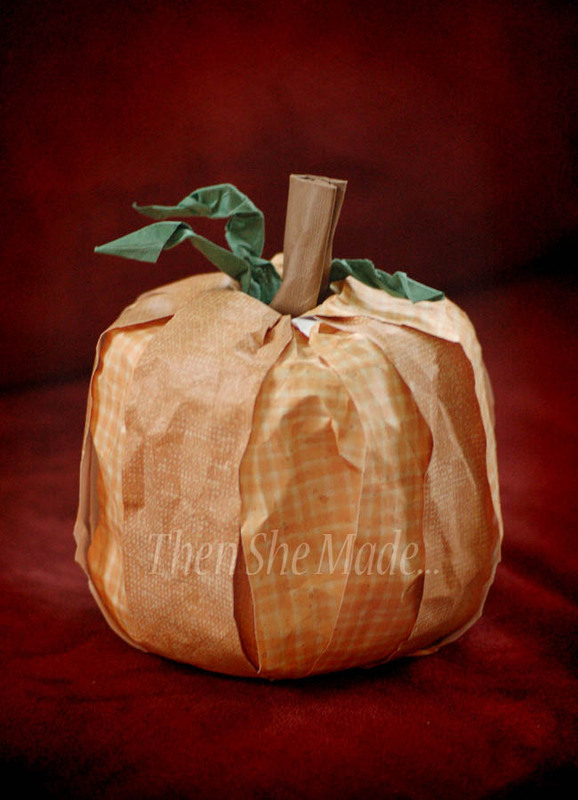 Here's a quick visual on how I did the paper pumpkin. Easy right? Just a few tips and other ideas. I wanted a little texture so I crinkled up the strips of paper before tucking them into the tube. Also, to get them to stay in place I did use a little scotch tape in the center of the tube to hold them down. And, if you want to make it look more distressed and a bit rustic you could always ink the edges. Fun right? These little pumpkins have become a must-do craft tradition for us and we will make them every year. Oh, and if you make your own. At the end of the season, the fabric comes off really easy and you can just save the fabric square so it's ready for next year. The paper versions tends to get a little brittle in storage so I usually make them with new paper strips each year. Amy I love this!!! Sooooooo cute!! Thanks for sharing... love your new blog! Um! I NEED that! Actually I need a couple dozen of them! Off to Costco to buy a LOT of toilet paper!! I am going to feature this on my blog later today! LOVE this!! So glad Lorie featured it on her blog today...you've got a new follower! I am excited to try the pumpkins! I am a "be different follower too"
This is such a cute idea! I would love to feature this on my blog on September 1 and credit and link back to you. If that is a problem, let me know. Welcome to blogland! That is adorable! I'm putting it on my craft list for when my best friend comes to visit next weekend! I agree.. LOVE the almost antiqued look of the paper pumpkins. Thanks for the tutorial! This is fabulous!